Governor Andrew M. Cuomo today celebrated the milestone “Topping Off” at the University at Buffalo’s Jacobs School of Medicine and Biomedical Sciences. The Governor signed a steel beam that was raised and placed atop the eight-story, 628,000-square-foot facility which is expected to be completed in 2017. The project marks the largest such medical education building currently under construction in the nation. Upon completion, the new medical campus will bring more than 2,000 students, faculty and staff to the heart of downtown Buffalo. A rendering of the facility can be found here. The downtown medical campus is expected to generate both immediate and long-term economic benefits to the city of Buffalo. 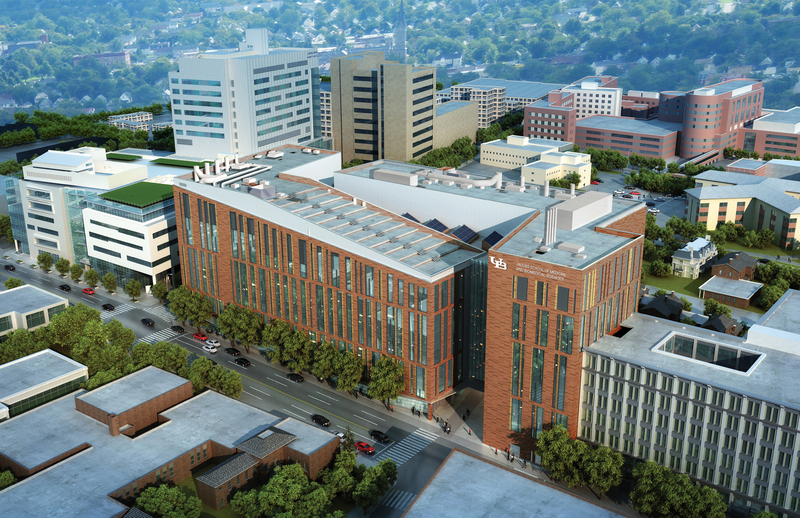 Once completed, the Jacobs School of Medicine and Biomedical Sciences will bring 2,000 UB faculty, staff and students to downtown Buffalo, increasing population density in the city while providing opportunities for retail and housing development, incubators, research parks and more. The new building will allow UB to expand its medical school class size from 140 to 180 students and add 100 new physician-scientists to the UB faculty, many of whom are recruited from the world’s top medical institutions. With steel construction complete, the new building will soon add a permanent roof and more than 300 windows. Beginning this summer, workers will install the building’s outer envelope, including its terra cotta exterior, which was selected to complement the region’s rich architectural heritage. The building design was produced by HOK, a global design, architecture, engineering and planning firm who was selected for the project by the university in 2012. To date, roughly 300 workers are employed at the construction site each day, marking the largest construction project in the university’s 170-year history. That number is only expected to grow in the coming months as more workers are employed to finish the building’s expansive interior. Estimated women and minority business enterprise participation for the first phase of the project is 24.7 percent, and 20.2 percent for the project’s second phase. The Jacobs School of Medicine and Biomedical Sciences will facilitate collaboration with physicians and scientists at UB’s Clinical and Translational Research Center, the Kaleida Health-Gates Vascular Institute, Roswell Park Cancer Institute, John R. Oishei Children’s Hospital, Buffalo General Medical Center and the Hauptman-Woodward Medical Research Institute. The facility puts superior medical education, clinical care and pioneering research in close proximity, anchoring Buffalo’s evolving comprehensive academic health center in a vibrant downtown setting. The medical campus will better enable the school to advance health and wellness across the life span for the people of New York and the world through research, clinical care and the education of tomorrow’s leaders in health care and biomedical sciences. The new medical campus at the University of Buffalo is made possible in part by Jeremy M. Jacobs, his wife and their family who donated $30 million to advance the project in 2015. In recognition of Jacobs’ tremendous service and philanthropy to the university, the UB medical school will be named the Jacobs School of Medicine and Biomedical Sciences. Mayor Byron Brown said: “Today’s topping-off ceremony at the Jacobs School of Medicine and Biomedical Sciences Building is a magnificent milestone. In just two years, the $375 million construction project has entered the home stretch. University at Buffalo’s growing presence in downtown Buffalo is bringing a new strength to the Buffalo Niagara Medical Campus as a center of learning, economic growth and a new opportunity for all city residents. I congratulate Governor Andrew Cuomo and UB President Satish Tripathi on today’s achievement and for helping us continue the positive momentum that’s occurring right now in Buffalo as we continue to revitalize all of our neighborhoods and further improve the lives of all of our residents." Erie County Executive Mark Poloncarz said: "Erie County's transformation into a medical- and health sciences hot spot on the national scene continues to grow as the new Jacobs School of Medicine and Biomedical Research becomes a reality. It's been a long way from the drawing board to placing the final steel beams on this transformational project, but the transformational effect this new facility will have on our workforce, our County and City, and our reputation will be long lasting. I thank Governor Cuomo, the UB Medical School, and all the partners involved for their vision in getting this done."